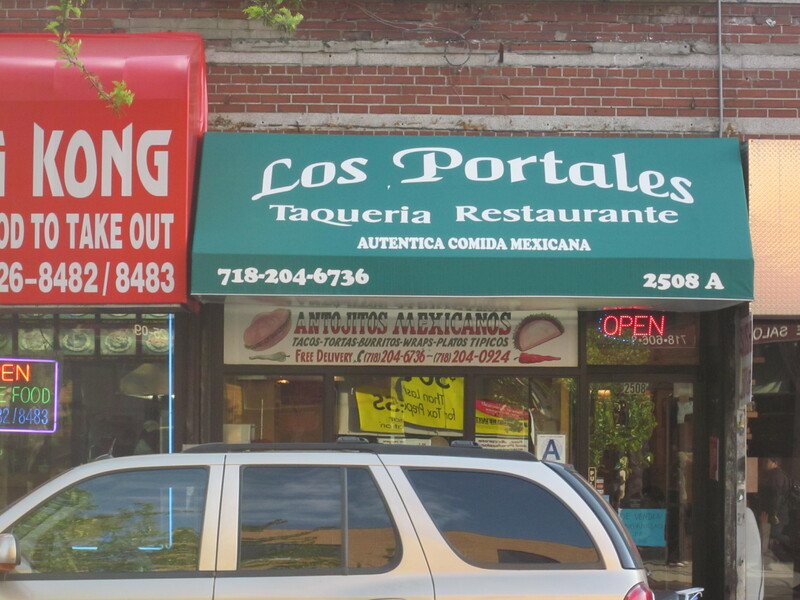 Cinco de Mayo was more than ten days away, yet Rick used the Mexican heritage celebration as his reasoning for choosing the Astoria-located, Los Portales Taqueria as our next eating destination. A few hours before our assigned dining date, however, I received a text from Rick saying his boss was “urging” him to have dinner with him in New Jersey. So instead of celebrating an early Cinco de Mayo at a taqueria in Queens, Rick was in Newark eating red meat at a Brazilian steakhouse. And it some ways, it was a good thing. As it was, we had to squeeze an extra chair around the biggest table at Los Portales to fit the five of us. If Rick were present, one of us would have had to eat at a separate table, which, depending on who was the odd man out, was not necessarily a bad thing. 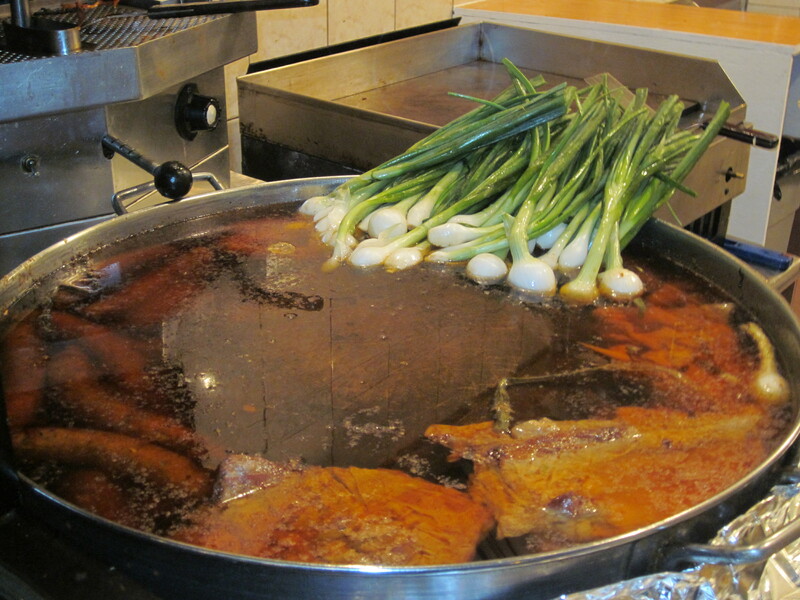 The menu covered all the basics: tacos, cemitas, tortas, burritos, tostadas, quesadillas, and assorted familiar platters like pechuga de pollo, bistec en salsa rojo, and fajitas. There were also bonus items that we had no interest in like wraps, “hamburgesas,” vegetarian specials, and hard shell tacos. Despite the limited English, hand gestures and finger pointing made ordering very easy. We started with two orders of guacamole. They came on plates with chips sticking out of the bright green mounds of guacamole like Mayan temples. 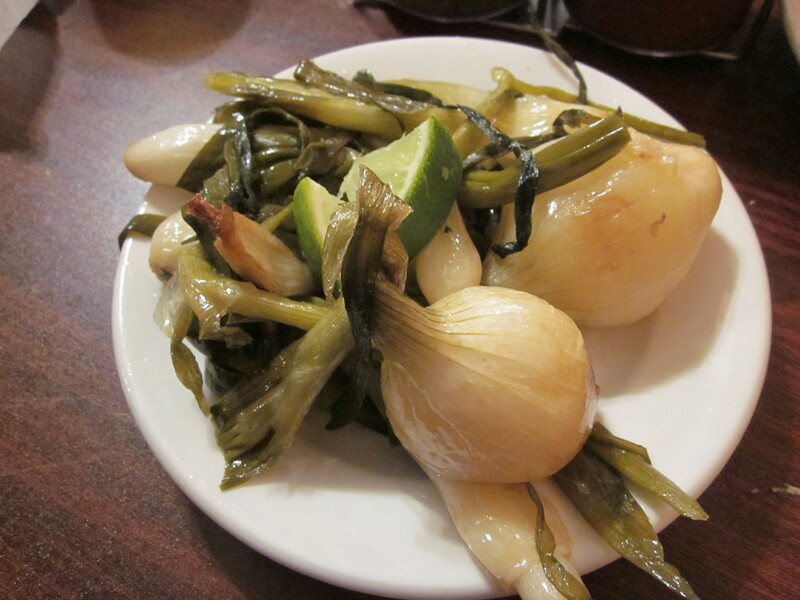 With the guacamole we also tried the grilled green scallions, some so big they were more like spring onions; the char bringing out their sweetness. 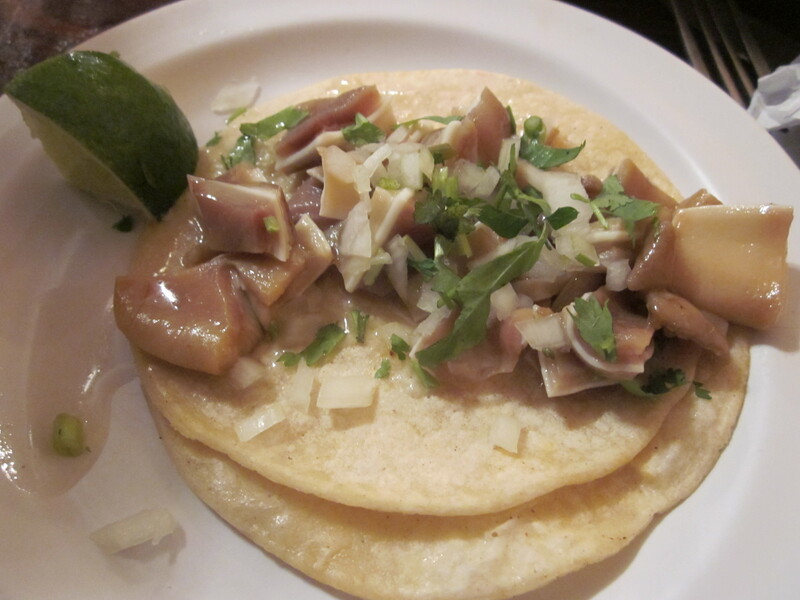 Zio quickly gravitated to the oreja taco, known in English as pig’s ear while I started with a saudero (veal flank). Sprinkling some of the restaurant’s red salsa on it, I devoured the taco quickly. Zio was a little more hesitant with his pig ear taco, however. The tiny pieces of chopped ear were so smooth it was as if the pig had them waxed. Gerry noticed that Zio had left an assortment of the ear pieces on his plate. “You’re not eating those,” he inquired. Who am I to judge on what another man orders at an authentic taqueria? So I tried to keep my mouth shut when both Eugene and Zio chose the pedestrian chicken fajita. Gerry went a bit more adventurous with the chilaquiles with huevos; a variation of huevos rancheros; the eggs served over cut corn tortillas and doused in a green tomatillo sauce. 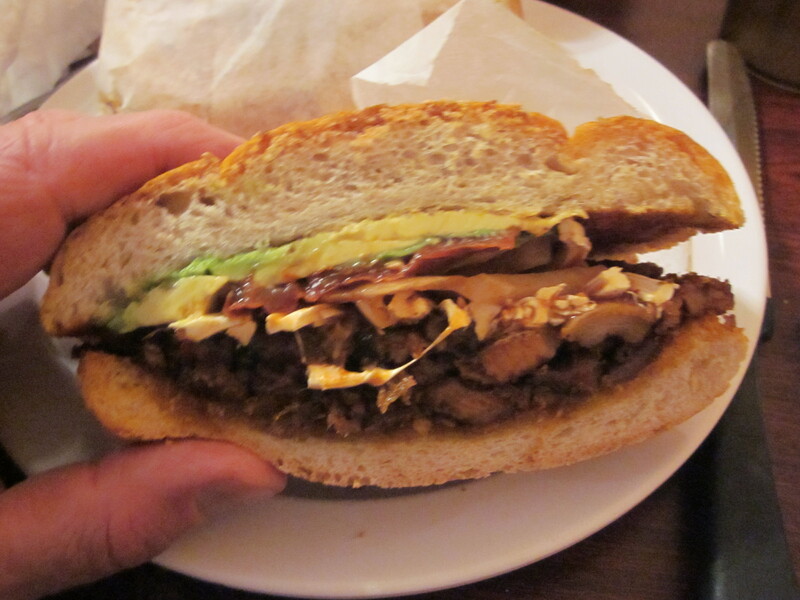 My choice; the al pastor cemita, a fresh sesame seeded roll stuffed with chunks of the burnt-red roasted pork, avocado, cheese, and salsa rojo was so good I plan on scouring the nearby taquerias of East Harlem to see if the sandwich can be replicated thus saving me a subway ride to Astoria. 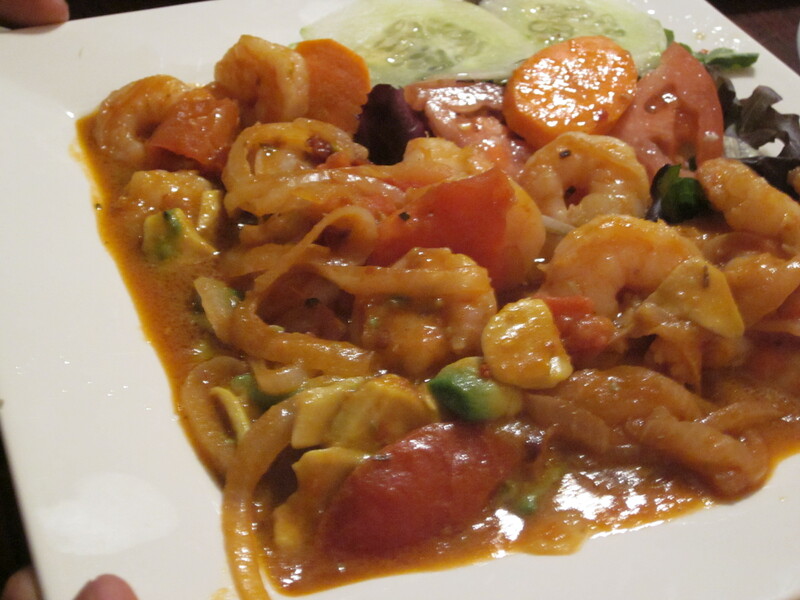 While the rest of us had long finished, Mike from Yonkers was deliberately nibbling at whatever it was he ordered that included shrimp, and from what I could make out, also peppers and onions, and lots of them. The eating of the meal was a studied process. He would break off a small piece of the tortillas that came with his meal, scoop some shrimp onto it, add a little rice, then some beans, a drizzle of one of the salsas; sometimes green, other times red, and then slowly chew, swallow and then repeat the process. When he finally finished, he abruptly headed to the rest room. His absence was not immediately noted; the hysterical clamoring from a Spanish-language comedy Zio dubbed the “Mexican Honeymooners” that played on the television in the restaurant distracting us from Mike from Yonker’s wherabouts. When we were no longer amused by the bizarre comedy on the television, Zio proudly whipped out a card. “Do you know what this is?” He asked waving it in front of us. None of us had a clue. 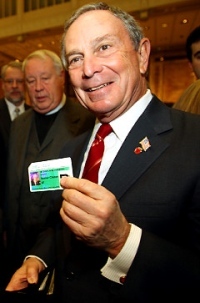 Like Zio, Mayor Bloomberg is also very proud of his senior citizen metrocard. Zio’s senior citizen metrocard held our interest for a few minutes more and when the thrill receded, I realized the seat next to me remained empty. Mike from Yonkers had been gone for a long time. “I hope he’s alright,” I said and as if on cue, he emerged from the rest room. With that admission, we all looked at each other. There wasn’t much to say. If a man wants to celebrate Cinco de Mayo ten days before the actual holiday with a double dose of Mexican food that is his right. But, still, we didn’t have to stick around to witness the potentially nasty consequences of such a decision. And with that we parted company.